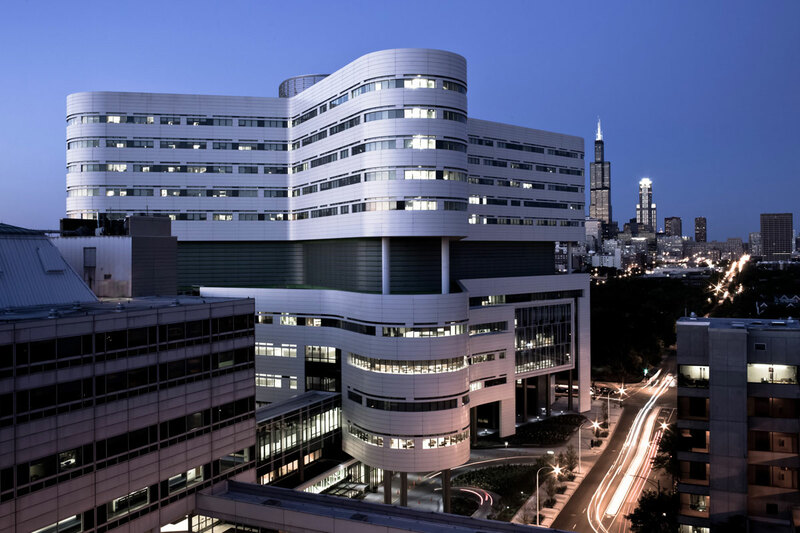 The new 14-story $654-million hospital building at Rush University Medical Center in Chicago, which is referred to as The Tower, stands out on the city’s skyline with a unique butterfly design and striking white exterior – both visual symbols of the medical center’s goal to transform healthcare delivery. 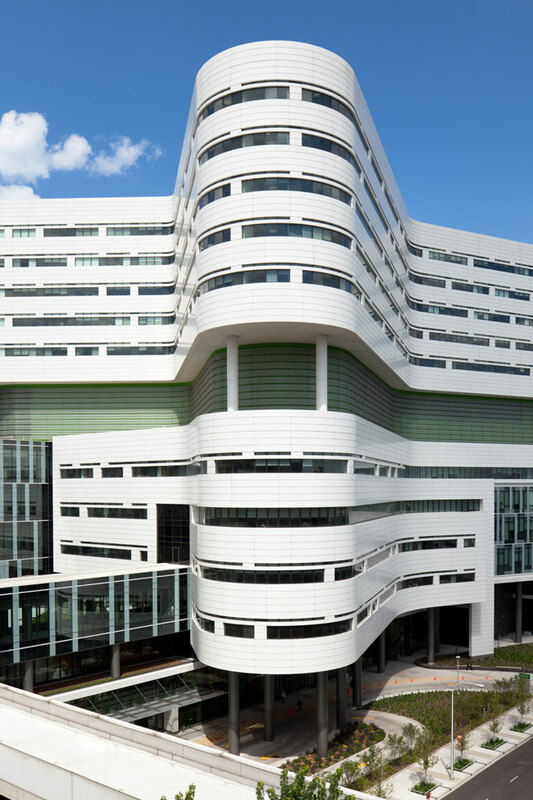 Formable Alucobond® Plus aluminum composite material in the custom Spinnaker Bone White color was selected to realize the hospital’s shining, clean exterior image and its unique butterfly design. The Tower – which opened in January 2012 – is the major component of Rush’s 10-year $1-billion campus redevelopment project called the Rush Transformation, which includes new construction, renovations of existing buildings and investments in leading technology across the 30.5-acre campus, according to Rush. The 840,000 square-foot LEED-Gold Tower stands out in the market not only by offering state-of-the-art healthcare technology but by the medical center’s overriding goal to re-orient its facilities around patients and their families. 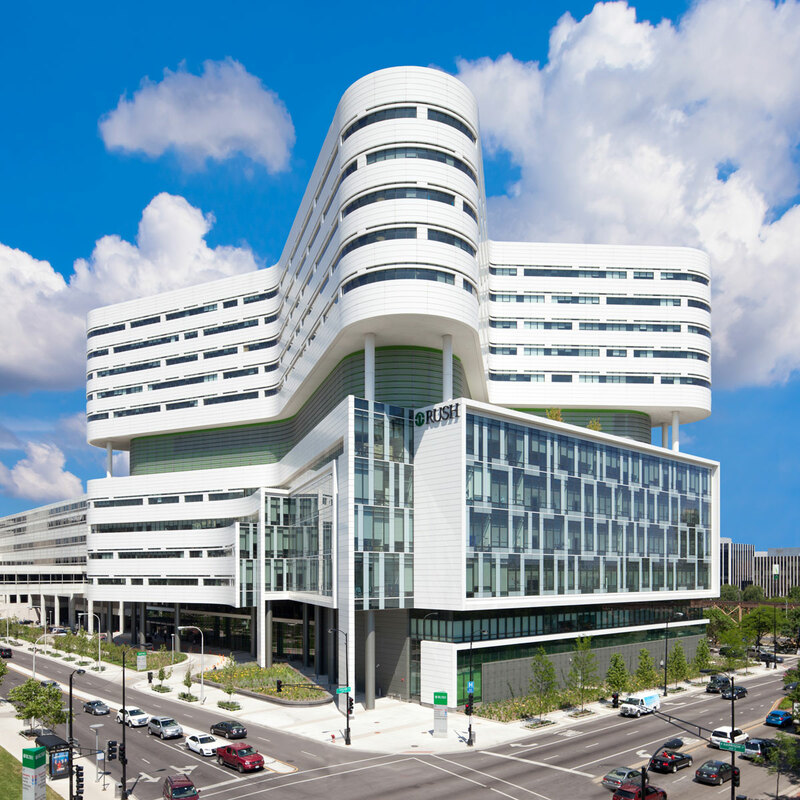 To achieve this goal, leaders at Rush University Medical Center enlisted the aid of doctors, nurses, staff and patients – some of whom worked as members of the Office of Transformation – to help architects design the new hospital. A corner lot that was home to campus tennis courts was chosen as the site of the new Tower, which also serves as “a gateway to the campus,” according to Moorhead. 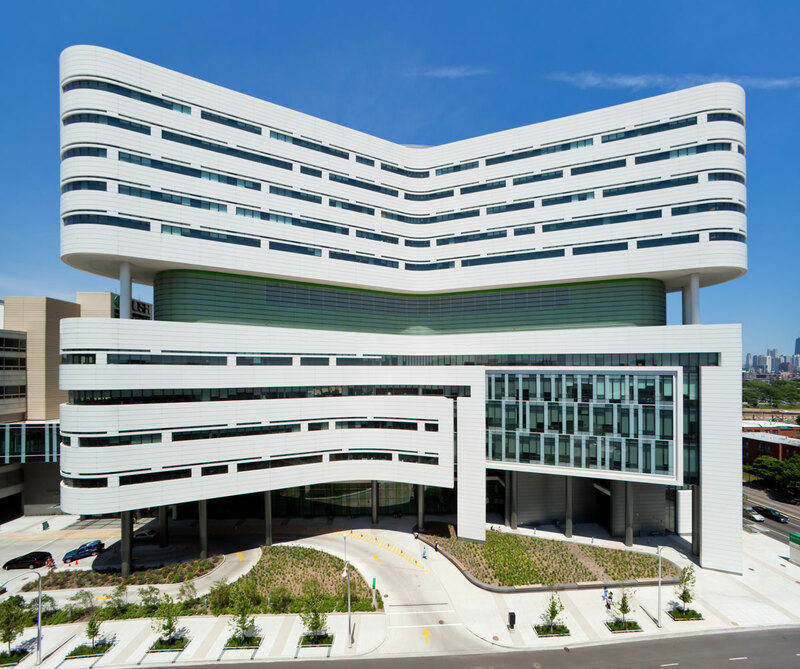 The butterfly design is featured on the hospital’s top five floors – which house 304 individual adult and critical care beds – and was suggested following Rush transformation team input. Patient care is delivered in four building quads with hospital rooms arranged in a triangular shape to “increase the close proximity to patients for nurses,” according to Moorhead. The Tower’s ground floor houses an advanced emergency response center, which is prepared to treat large-scale health emergencies. The Tower also includes three consecutive floors devoted to an interventional platform in which diagnostic testing services, surgical services, interventional services and recovery areas are located within a short distance of each other. A full-scale patient hospital-room floor plan was painted onto the tennis courts before construction began to allow doctors and nurses to test out the design that features decentralized nursing stations with no counter barriers between patients and families, “They were completely focused on the experience of patients and their families as well on the safety of patients and staff members,” according to Moorhead, who said this real-life test of the patient-care space cemented the curved butterfly floor-plate design with Rush leaders. Chicago-based Powers/Jacobs Joint Venture, which served as construction manager for the Tower, turned to ASI Ltd., previously of Whitestown, Ind., for exterior walls. Sobotec Ltd., of Hamilton, Ontario, served in a design-assist role with ASI as fabricator of the Alucobond panels, which were installed with glass in a unique unitized curtain wall system. 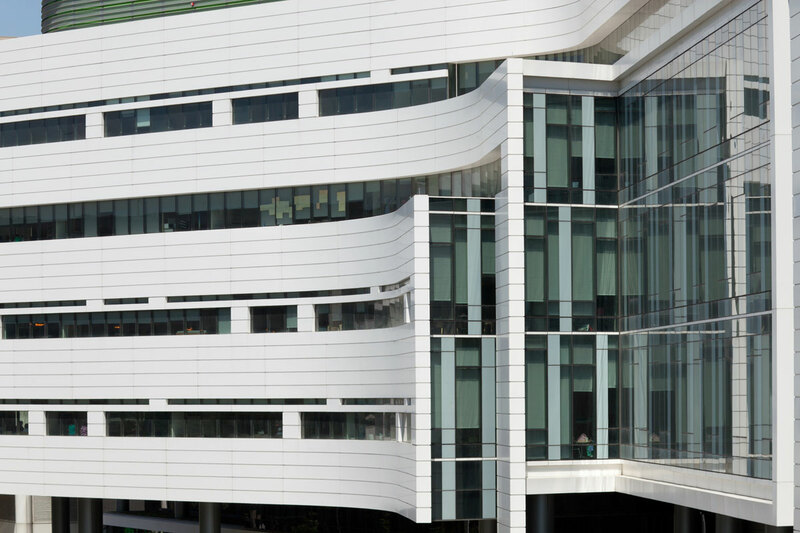 A total of 267,000 square feet of Alucobond Plus was installed on the Tower, including approximately 250,000 square feet of Alucobond Plus in the custom Spinnaker Bone White color and 4mm thickness as exterior wall cladding. Approximately 17,000 square feet of Alucobond Plus in the custom Sunstorm Rum Pewter color and 4mm thickness was installed as a recessive color accent on column covers and on interior mullions. The unique unitized curtain wall system was utilized to enclose the Tower as quickly as possible. Sobotec created AutoCAD computer-generated drawings to fabricate Alucobond panels that were sent to ASI for inclusion in a prefabricated curtain wall featuring a framed support system for the metal panels and glass. The original Perkins+Will design concept utilized glass to create the butterfly design, according to Moorhead, who said that glass was rejected because it did not fit the grid concept and that metal panels proved to be more cost-effective. The Tower at Rush University Medical Center marked the first time that Moorhead had incorporated Alucobond aluminum composite material in a building design.